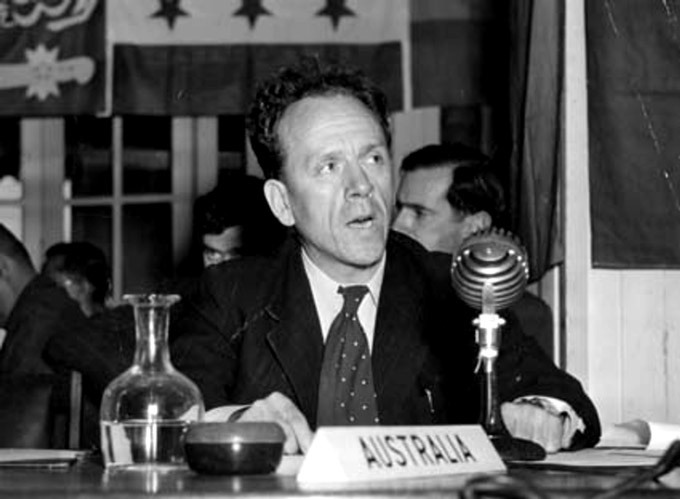 H.C. Coombs at the Lapstone Conference in 1948. Source: Wikipedia Commons. The H.C. Coombs Creative Arts Fellowship was established in 1964 at the instigation of Dr H.C. Coombs, ANU Pro-Chancellor at the time, to encourage creative work in the arts in Australia. Fellowships were filled by invitation rather than by public advertisement, and fellows selected by the Vice-Chancellor in consultation with an advisory committee. It was hoped other Australian Universities would follow the ANU example and establish similar schemes for the encouragement of creative artists. The fellowship has supported Australian artists such as Judith Wright, John Perceval, Arthur Boyd, Fiona Hall and Robyn Davidson. The invited fellowships are offered to visual and performing artists and writers on a rotation basis. From its inception, the term creative artist was interpreted quite loosely, musicians and architects being initially the only definite exclusions, and during the course of the fellowship the University has hosted persons such as Don Burrows, Don Banks, Arthur Cantrill, Judith Clingan, George Golla, George Dreyfus, Alan Gould, Rodney Hall, Xavier Herbert, Christina Stead, Penny Tweedie and Clive Scollay, and Judith Wright. (View the full list). Visual artists have included painters, ceramists, printmakers, sculptors, tapestry-weavers, graphic-designers and artists interested in the use of scientific equipment and techniques in artistic creation. The University envisages that the Fellow’s work and achievements whilst in residence will be represented by some formal legacy; performance, or documentation. The Fellowship is intended for experienced artists including artists from traditional backgrounds with recognised professional standing in their community, who are in mid-career and who have an established arts practice, normally a minimum of five years professional practice. This includes aboriginal artists and musicians from traditional backgrounds with recognised standing in their own communities. For performance artists, and others for whom professional practice precludes long-term continuous residency, should demonstrate how shorter or intermittent residency periods could achieve the goals of the Fellowship. The Fellowship is up to $33,000, which is intended to cover accommodation, travel, living expenses and material costs (associated with the Fellows particular discipline). Funds must be spent in the year the Fellowship is undertaken and funds will not be carried forward. Depending upon the area of practice and individual requirements, the Fellowship will offer study or studio facilities at the University to the recipient. In some cases, these may need to be shared in some form with other practitioners. For applicants proposing intermittent periods of residency, their applications should contain a proposal of how the available funding should be structured to enable their Fellowship to proceed. In-kind or other assistance may be available from the University for the public programs in which the Fellow is involved: e.g. performances, exhibitions, seminars, public meetings, or workshops. Depending upon the financial requirements of the selected Fellow, a second Fellowship, possibly for a reduced tenure period, may be awarded in any calendar year. The H. C. Coombs Creative Arts Fellowship is administered by the Research School of Humanities & the Arts (RSHA) and a H. C. Coombs Creative Arts Fellow Advisory Committee. The H. C. Coombs Creative Arts Fellowship is administered by the Research School of Humanities & the Arts (RSHA) and a H. C. Coombs Creative Arts Fellow Advisory Committee. This Committee is chaired by the Director RSHA with representatives from the School of Literature, Languages and Linguistics, the School of Art, and the School of Music. Two independent experts are also included. 1. The Committee actively consults widely with University colleagues seeking their interest to nominate appropriate artists for the Fellowship. The nomination will reflect the proposed areas relevance to the three-year cycle. 2. At its discretion, the Committee may advertise externally for expressions of interest. Indicate the contact person who agrees to undertake the organisational responsibilities in hosting the Fellowship with the Research School of Humanities & the Arts. Provide an indication of the likely outcome of the residency. Nominations must be supported by an academic unit of the University in addition to the Research School of Humanities & the Arts. Written nominations should be submitted by the nominating academic unit of the University on behalf of the nominated person. Fellows will be co-located between the Research School of Humanities & the Arts and the nominating area with office space arrangements determined by the nature of the Fellow's practice. Upon selection the fellowship process will follow the CASS guidelines for visitor administration including gaining approval from the College Head. Please note that only hard copy nominations will be accepted. An acknowledgement of the nomination will be sent to the artist. Closing date for submissions is generally the end of October each year. Artistic standing of the proposed Fellow. Quality of the proposed creative work program and its potential for visibility and engagement with the University community. Potential for contact and collaboration with other parts of the University and the community. The University reserves the right not to award the Fellowship in a particular calendar year. The Advisory Committee requires a written report providing an account of activities during the course of the Fellowship, outlining the benefits of the residency. Other comments and recommendations on ways in which the Fellowship could be improved within its existing limits for the benefit of future Fellows are welcome. This report should be completed by the Fellow prior to leaving the University at the completion of the residency period. Final Fellowship payments will only be paid to the Fellow upon the University’s receipt of the Report.